This report is available below in multiple sections, which are 508–compliant, and as the entire 191–page document for printing only. Consumptive water use is the portion of water withdrawn (for a particular use) that is evaporated, transpired, incorporated into products or crops, consumed by humans or livestock, or otherwise removed from the immediate water environment. 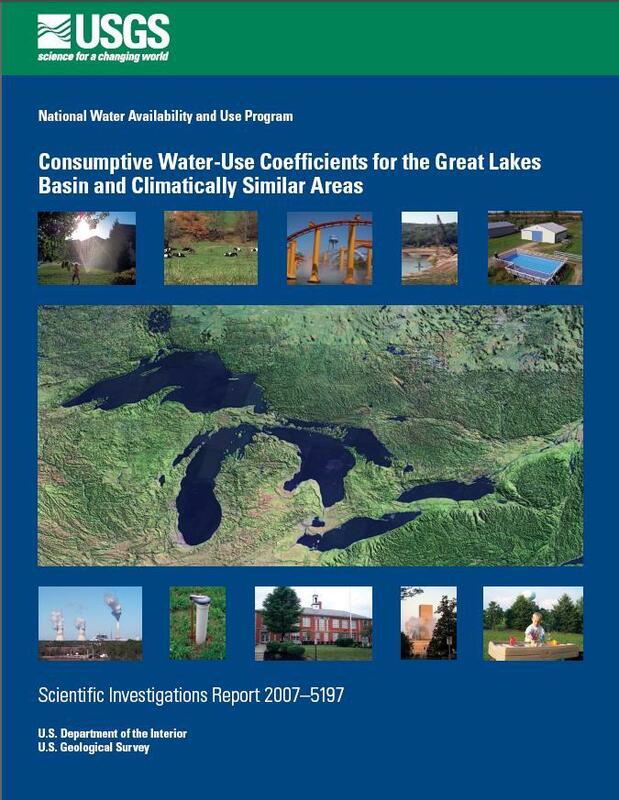 This report, which is organized by water–use categories, includes consumptive–use coefficients for the Great Lakes Basin (including Canada) and for areas climatically similar to the Great Lakes Basin. This report also contains an annotated bibliography of consumptive water–use coefficients. Selected references are listed for consumptive–use data from elsewhere in the world. For the industrial water–use category, the median consumptive–use coefficients were 10 percent for the Great Lakes Basin, climatically similar areas, and the world; the 25th and 75th percentiles for these geographic areas were comparable within 6 percent. The combined domestic and public–supply consumptive–use statistics (median, 25th and 75th percentiles) were between 10 to 20 percent for the various geographic areas. Although summary statistics were similar for coefficients in the livestock and irrigation water–use categories for the Great Lakes Basin and climatically similar areas, statistic values for the world on a whole were substantially lower (15 to 28 percent lower). Commercial and thermoelectric power consumptive–use coefficient statistics (median, 25th, and 75th percentile) also were comparable for the Great Lakes Basin and climatically similar areas, within 2 percent. References for other countries were not found for commercial and thermoelectric power water–use categories. The summary statistics for the mining consumptive–use coefficients varied, likely because of differences in types of mining, processes, or equipment. 1. The Great Lakes surface–water basin. 2. States considered climatically similar to the Great Lakes States. 3. Percent consumptive loss in the conterminous United States, by water–resources region, in 1995. 4. Water–resources regions used in selection of climatically similar States. 5. Representation of consumptive use by a single facility where consumptive use is equal to withdrawal minus return flow. 6. A diagrammatic example of calculating consumptive use with a water–use balancing equation. 7. Schematic of the summary tables of consumptive–use coefficients for the Great Lakes Basin, climatically similar areas, and the world. consumptive use in the United States and Canadian part of the Great Lakes Basin in 2002. 10. Map showing domestic consumptive–use coefficients from various sources for the Great Lakes States. 1960 to 1995, from USGS Circulars. 12. Boxplot showing the distribution of industrial consumptive–use coefficients for the Great Lakes Basin and climatically similar areas. 13. Map showing industrial consumptive–use coefficients from various sources for the Great Lakes States. 14. Map showing thermoelectric power consumptive–use coefficients from various sources for the Great Lake States. 16. Boxplot showing the distribution of irrigation consumptive–use coefficients for the Great Lakes Basin and climatically similar areas. 17. Map showing irrigation consumptive–use coefficients from various sources for Great Lakes States. 18. Livestock consumptive–use coefficients for the Great Lakes Basin and climatically similar areas. 19. Commercial consumptive–use coefficients for the Great Lakes Basin and climatically similar areas. 20. Mining consumptive–use coefficients for the Great Lakes Basin and climatically similar areas. 6. Examples of calculating consumptive use and return flow using a consumptive–use coefficient for self supplied facilities. 7. Water use and consumptive use in the U.S. part of the Great Lakes Basin in 1995. 8. Water use and consumptive use in the Great Lakes Basin in the United States and Canada, 2002. 9. Consumptive–use coefficient statistics for water–use categories for the Great Lakes Basin, climatically similar areas, and the world. 10. Summary–table terms and descriptions. 11. Summary of domestic and public–supply consumptive–use coefficients for the Great Lakes Basin, climatically similar areas, and the world. 12. References that include discussions on unaccounted–for water (conveyance losses and public uses). 13. Selected state standards for unaccounted–for water (water losses). 1998–2002 and USGS Circulars, 1988–98. years from 1900 through 1995. 17. Domestic and public–supply consumptive–use coefficients for major countries, continents, and the world. 19. Summary of industrial consumptive–use coefficients for the Great Lakes Basin, climatically similar areas, and the world. 20. Summary statistics of industrial consumptive–use coefficients from selected references. 22. Industrial consumptive–use coefficients for major countries, continents, and the world. 24. Industrial consumptive use for six industrial major–group categories with the largest consumptive use in the Great Lakes Basin in 1983. 25. Industrial consumptive–use coefficients, by industrial category, for six industry groups. 26. Summary statistics for industrial consumptive–use coefficients listed in table 25 for six industrial groups. 27. Ethanol–production water use, return flow, and consumptive–use coefficients. 28. Industries with a consumptive–use coefficient greater than 30 percent in 1983. 29. Summary of thermoelectric power consumptive–use coefficients for the Great Lakes Basin and climatically similar areas. 30. Summary statistics of thermoelectric power consumptive–use coefficients from selected references. 31. Summary of irrigation consumptive–use coefficients for the Great Lakes Basin, climatically similar areas, and the world. 32. Summary statistics of irrigation consumptive–use coefficients from selected references. 35. Agriculture consumptive–use coefficients for large countries, continents, and the world. 36. Summary of livestock consumptive–use coefficients for the Great Lakes Basin, climatically similar areas, and the world. 37. Summary statistics of livestock consumptive–use coefficients for selected references. excluding Solley and others (1998) and excluding agriculture coefficients. 39. Summary of commercial consumptive–use coefficients for the Great Lakes Basin and climatically similar areas. 40. Summary statistics of commercial consumptive–use coefficients for selected references. 42. Summary statistics for mining consumptive–use coefficients from selected references. 43. Consumptive–use coefficient statistics for the Great Lakes Basin, climatically similar areas, and the world, by water–use category. for the Great Lakes Basin and Great Lakes States. for water–resources regions and states climatically similar to the Great Lakes Basin. for the Great Lakes	Basin and Great Lakes States. compilation year, for the	Great Lakes Basin and Great Lakes States. compilation year, for the water resources	regions and states climatically similar to the Great Lakes Basin. compilation year, for the Great Lakes Basin and Great Lakes States. compilation year, for water resources regions and states climatically similar to the Great Lakes Basin. for water–resources regions and states climatically similar to the Great Lakes States. for the	Great Lakes Basin and Great Lakes States. 2–1. Census of Manufacturing: summary of 1983 water–use statistics for Great Lakes States. 2–2. Census of Manufacturing: summary of 1983 water–use statistics for states climatically similar to the Great Lakes Basin. climatically similar areas in 1983. 2–4. Census of Manufacturing: summary of 1983 water–use statistics for major groups. 2–5. Census of Manufacturing: summary of 1983 water–use statistics for industry groups and individual industries. 3–1. Consumptive–use coefficients used by Great Lakes jurisdictions, by water–use category. 3–2. Total water use by category for the Great Lakes Basin, by year, from the Great Lakes Commission annual reports, 1998–2002. 3–3. Self–supplied industrial water use and consumptive use for the Great Lakes Basin, by jurisdiction and year, 1998–2002. 3–4. Fossil fuel power water use and consumptive use for the Great Lakes Basin, by jurisdiction and years, 1998–2002. 3–5. Nuclear power water use and consumptive use for the Great Lakes Basin, by jurisdiction and year, 1998–2002. 3–6. Public–supply water use and consumptive use for the Great Lakes Basin, by jurisdiction and year, 1998–2002. 3–7. Domestic–supply water use and consumptive use for the Great Lakes Basin, by jurisdiction and year, 1998–2002. 3–8. Irrigation water use and consumptive use for the Great Lakes Basin, by jurisdiction and year, 1998–2002. 3–9. Livestock water use and consumptive use for the Great Lakes Basin, by jurisdiction and year, 1998–2002. and wholesale and retail trade in the Canadian part of the Great Lakes Basin, 1972–91. 5–1. Annual water requirements for offstream uses for agriculture, irrigation, and livestock during base conditions. 5–2. Annual water requirements for offstream uses for steam electrical and manufacturing withdrawals during base conditions. 5–3. Annual water requirements for offstream uses for commercial and domestic water-use categories during base conditions. 5–4. Annual water requirements for offstream uses for mining water–use categories during base conditions. Shaffer, K.H., and Runkle, D.L., 2007, Consumptive Water–Use Coefficients for the Great Lakes Basin and Climatically Similar Areas: U.S. Geological Survey Scientific Investigations Report 2007–5197, 191 p.
For more information about activities of the USGS National Water Availability and Use Program, see the USGS Water Use in the United States home page.